The Banana Bird Caves are a series of caverns that contain an imprisoned Banana Bird and appear throughout the Northern Kremisphere. They only appear in Donkey Kong Country 3: Dixie Kong's Double Trouble! During Baron K. Roolenstein's invasion of the Northern Kremisphere, he trapped the Banana Bird Queen behind a barrier and imprisoned every Banana Bird in a Banana Bird Cave, to ensure that he would not be opposed. Throughout their adventure, Dixie and Kiddy Kong must rescue the Banana Birds trapped in every Banana Bird Cave, one of which appears in every world, and a few on the Northern Kremisphere map itself. A few of the Banana Bird Caves can only be reached with the help of a Brothers Bear, or by using the Gyrocopter. When visiting a Banana Bird Cave (which Cranky Kong introduces to the Kongs upon first visiting one in the Game Boy Advance port), the Kongs must participate in a concentration challenge and notice the sequence in which the red, green, yellow, and blue crystals flash in. Each crystal is arranged and colored the same as the , , , and buttons on a Japanese and European Super Nintendo Entertainment System controller, and each button causes its corresponding crystal to light up. The sequence in which the crystals flash is always random, and the player can replicate the sequence by pushing the buttons in the same order that the crystals flash in. In the Game Boy Advance port, the is used to activate the crystals; similarly, the crystals are activated based on which arrow button the player presses. 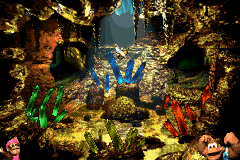 A Banana Bird Cave has a mostly empty scenery except for some tunnels that appear in the background. By successfully replicating the order, the Banana Bird breaks out from the small crystal it is imprisoned in, and the Kongs obtain it. If the Kongs do not replicate the order correctly, they leave out of the Banana Bird Cave and must re-enter it if they want to retry the challenge. Bounty Beach – Northern Kremisphere overworld, east of Funky's Rentals. It can be reached by using any of Funky Kong's vehicles. Kong Cave – Northern Kremisphere overworld, northwest of Bazaar's General Store, behind several rocks. The Hover Craft (or better) is required to reach it. Undercover Cove – Northern Kremisphere overworld, north of the waterfall near Kong Cave. The Turbo Ski or Gyrocopter is needed to reach it. Belcha's Burrow – Northern Kremisphere overworld, southwest of Bazaar's General Store, across the water. The Gyrocopter is required to reach it. K's Kache – Northern Kremisphere overworld, on the island in the northwestern lake (SNES version) or in the cave north of it (GBA version). The Gyrocopter is required to reach it. Hill-Top Hoard – Northern Kremisphere overworld, far northeast cliff. The Gyrocopter is required to reach it. Smuggler's Cove – Lake Orangatanga, along the northern beach. Arich's Hoard – Kremwood Forest, across the river after completing Bobbing Barrel Brawl. After beating Brash's record in Riverside Race, he throws a tantrum at his stadium, sending a piece of driftwood down the stream as a bridge to the cave. Bounty Bay – Cotton-Top Cove, slightly northeast from Bazza's Blockade. Sky-High Secret – Mekanos, only reachable by using Big Bessie. Glacial Grotto – K3, just west of Blizzard's Basecamp. Clifftop Cache – Razor Ridge, reachable from Björn's Chairlifts. Sewer Stockpile – KAOS Kore, behind the sewer grate, which can be opened by decoding Baffle's clue. This page was last edited on April 13, 2019, at 21:14.